Jackie Anderson, Sarah Callahan, Tim Harrod, Tyler Hinman, Jeremy Horwitz, Robert Hutchinson, Dan Katz, Michael Lewis, Eric Maddy, Matt Matros, Stefanie Newhouse, Kiya Nicoll, Joon Pahk, Al Sanders, Xtina Schelin, Jeffrey Schwartz, Andy Silikovitz, David Stigant (the first to submit), Kurt Storm, Michael Sylvia, Byron Walden, and Scott Weiss. Incidentally, if you enjoyed these puzzles, you are also dead certain to enjoy "Mutant Sudoku" by Thomas Snyder and Wei-Hwa Huang (which I edited and did the illustrations for, but that's not the only reason I'm partial to it), so if you happen to be purchasing my book and need to toss something else into your cart to reach the free shipping minimum, consider giving that a shot as well. And I will see more of all of you...in the fuuuuture! Sudoku ... in ... Spaaaaaaace! That's right, everyone: Huzzah! (Or whatever the futuristic sci-fi equivalent of "Huzzah!" is -- "Fraktastic"?) My new book is out today: "Sudoku in Space"! I'm super-pleased with it, and it's available at all your standard online joints such as Amazon and B&N, in real-world bookstores, or from this very blog, if you are the winner of the Exciting Solving Contest below! In this puzzle, each solid colored circle represents a planet, and the hollow circles that match a planet's color represent its moons. The numbers associated with a planet's moons must add up to the planet's number. So, for instance, if a planet had two moons, and the planet's number was 8, its moons could be 1 and 7, 2 and 6, 3 and 5, or 4 and 4. In these puzzles, you and a counterpart in a parallel universe are both navigating starships whose starting locations are indicated by the blue squares. Both starships are attempting to reach a starbase located at the gray square. Starships may travel horizontally and vertically through vacant squares only -- that is, squares without given numbers in them -- and both ships' paths must contain the same numbers in the same order. 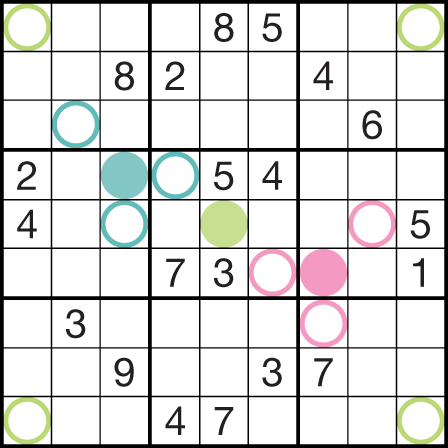 (Their starting squares will also contain identical numbers.) The two paths may not intersect. To enter the contest, solve all three puzzles by midnight, February 9, and send me your answers; you can scan your printouts and e-mail them to me at f_heaney[this is where the @ symbol goes]yahoo.com, or simply type up your answers. 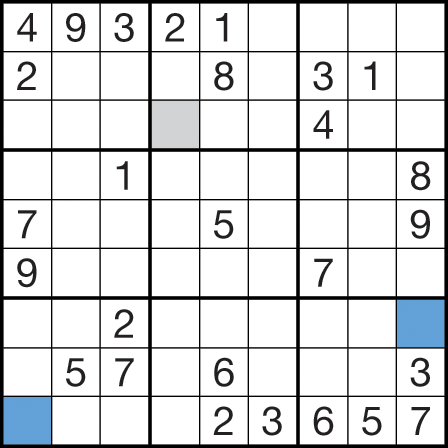 For the Parallel Universe puzzles, either circle the correct paths (if you scan your grids) or list the numbers in the path, in order (if you type your answers). One correct solver selected at random will win a free copy of the book! So there you have it! 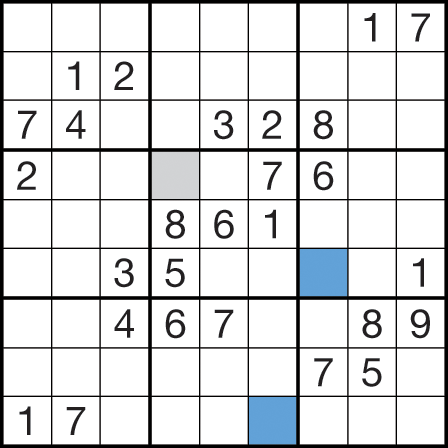 If you enjoy the puzzles, please spread the word (though if you wish to increase your chance to win by waiting until after the contest deadline to do so, I suppose I understand). Good luck!